The temporary dislocation of the knee cap. Sports Girl experienced this in her left knee, and it required surgery to correct. I have detailed our experience here. Sports Girl's left knee was still fairly swollen just 5 days post-op. It's still a little swollen even now, but not as much as this. 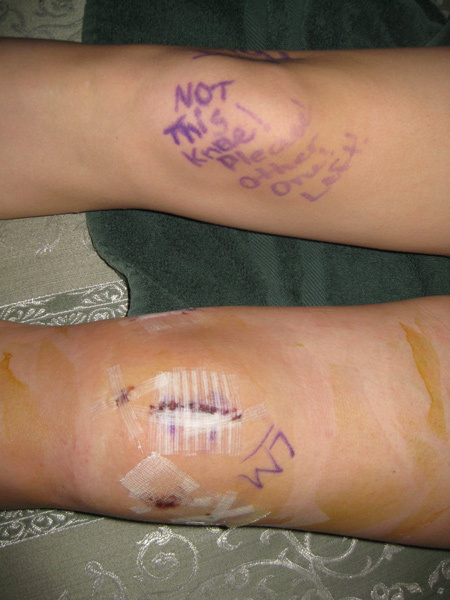 Notice, too, how she wrote on her good knee with permanent market to ensure the doctor didn't make any mistakes. Now at nearly 3 weeks post-op, Sports Girl is recovering quite nicely from her knee surgery. She has almost no pain, even when she’s worked hard twice a week by her physical therapist. Her doctor told us that females tend to recover from these types of surgeries quicker than males and that young people tend to recover quicker than older people. So with two positive attributes on her side, Sports Girl seems to be bouncing back especially fast. She still struggles a bit with mobility. She can just bend her left knee to almost a 70-degree angle; she says she feels a pulling sensation when she tries to go more than that. 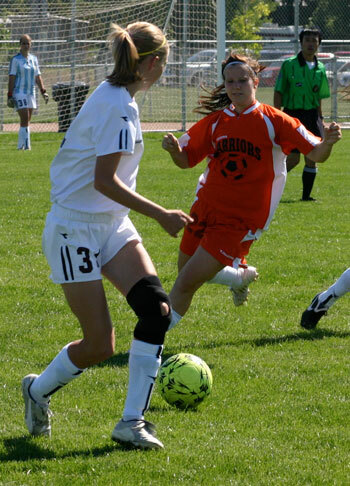 And she still wears the long brace to keep her leg straight almost all of the time. On the plus side, she actually can completely straighten her leg, which folks who’ve had this type of surgery often struggle to do. Sports Girl is also able to support her weight on her left knee. She actually ditches her crutches quite regularly around the house and sometimes even forgets where she left them! We had a fairly casual follow-up appointment with the orthopedic surgeon’s physicians assistant 10 days after the surgery. I think “casual” and “uneventful” are good qualities when it comes to describing doctor’s appointments. We go back to see the actual surgeon in 2 more weeks. The original estimate for complete recovery was 3 to 6 months, so at only 3 weeks, it’s really too soon to tell much. I won’t prematurely declare that Sports Girl will be running hurdles in track this spring or that she’ll be playing striker for spring soccer, but we are feeling cautiously optimistic. And even though this surgery has left Sports Girl sidelined from sports for most of her eighth grade year, we are at peace with our decision to have it done. Our hope is that she will recover better than she was before, that she will have a fun and successful scholastic athletic career and that she will lead a long and active life.